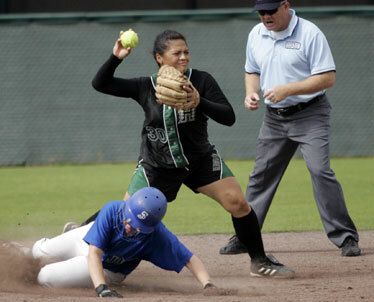 Hawaii shortstop Valana Manuma held onto the ball after forcing Dannielle Brown of San Jose State at second base. It looked like Bob Coolen would have to wait a while longer for career win No. 700. With the Hawaii softball coach sitting on 699 heading into the second game of yesterday's doubleheader with San Jose State, a fifth inning riddled with defensive miscues left the Rainbow Wahine down by three. But Clare Warwick delivered a momentum-turning homer and the Wahine scored five more times in the sixth to pull out a 9-6 win and complete the series sweep of the Spartans. "That was an interesting way to get it," Coolen said after receiving a plaque commemorating the milestone at home plate. "We didn't let down. I don't think I have seen that type of energy in our team for a while." The 20th-ranked Wahine edged the Spartans 1-0 on Friday and clinched the series with a 3-1 victory in yesterday's opener behind a solid pitching performance by Courtney Baughman. They spent most of the finale in catch-up mode before frustrating the Spartans with the late-game rally to extend their winning streak to seven. "We haven't had much success coming from behind most of the season, so it was a good challenge for us going into the road trip," said Warwick, who also drove in the go-ahead run in the opener. The trip Warwick referenced marks a pivotal point in the Western Athletic Conference season for league-leading Hawaii. The Wahine (31-11, 7-1 WAC) face the two teams chasing them in the standings -- No. 25 Nevada and No. 13 Fresno State -- on the mainland over the next two weekends. "We're so pumped up for that trip," she said. "We know we can really make our season if we do well on the road." Baughman (13-6) secured the series win for the Wahine by limiting the Spartans (21-25, 3-6) to five hits while striking out four in the opener. She gave up her lone run in the fourth and got some defensive help from center fielder Kaulana Gould, who made a diving catch of a sinking liner to help limit the damage. Offensively, Tanisha Milca homered to lead off the game and Brandi Peiler went 2-for-3 and drove in a run. With the game tied at 1, Peiler doubled to open the fourth and pinch runner Kanani Warren later scored when Warwick bounced and RBI single into left to give UH the lead for good. San Jose State threatened to end the UH winning streak in the series finale, taking a 3-1 lead in the third inning to send Kate Robinson -- who shut out the Spartans on Friday -- to her second shortest pitching outing of the season. After the Wahine knotted the game with two runs in the bottom of the third, SJSU broke ahead with three unearned runs in the fifth aided by four Hawaii errors. Warwick, instructed by Coolen to swing a lighter bat yesterday, began the comeback in the fifth by drilling a two-out homer to left, her first in 39 games. "I went into a bit of a slump, but I worked my way out of it and I feel good now," said Warwick, who is hitting .417 in WAC play. "I wasn't thinking about anything, which is usually when you do the best." In the decisive sixth, the Wahine put runners on second and third with two out when Robinson delivered a single to center to tie the score. Warwick then hit a routine grounder to third, but SJSU first baseman Natasha Hawkins lost the throw in the sun, which was setting behind the third-base bleachers, allowing Peiler to score the go-ahead run. Jessica Morton pitched 4 2/3 innings to pick up the win in relief of Robinson. SJSU brought the tying run to the plate with two out in the seventh, but Morton (5-2) got Nicole Wells to line out to third to end the game. "I'm used to the pressure situations," said Morton, UH's closer. "It's easier for me when I have pressure, because I have no choice but to do my job." Following the road trip, the Wahine have one regular-season home series left, May 3 and 4 against Utah State, before hosting the WAC tournament May 7-10.